Lots of issues surround food: its provenance, sustainability, nutritional value, how it’s grown. The list goes on. But, avoiding it altogether is not a brilliant idea. Pseudoscience, and its anomalous conclusions, is a dangerous business. When you consider the overabundance of food products available in western society, in our supermarkets, farmers markets, specialty food shops and restaurants, there seems to be no end of choice. We’re fortunate, but we’ve become victims of that good fortune. While much of the food available to us is wholesome, some is not. Processed food, which is consumed in huge amounts, contains high levels of sodium, preservatives and additional ingredients with names too difficult to pronounce. Just this week, Health Canada reported that 80 percent of us consume too much salt and that 77 percent of the salt we’re eating comes from processed food. The time for a reality check is long past. We need to admit that far too many of us have adopted a dangerous diet, one to which we stubbornly cling, even though we know the risks. Serious, life threatening risks. Obesity tops the list, which in turn can lead to diabetes, heart disease, stroke, high blood pressure and cancer, just for starters. I’m no Jack Sprat. I know I have work to do, but I’m far from alone. Look around. Apart from getting enough physical activity, we need to adjust the lens to focus mainly on a diet that is balanced, calorie appropriate, nutritionally sound, and not laden with sodium, sugar and unhealthy fats. A diet sensibly between the extremes, far away from what the sad breatharians are promoting and, at the other end, the daily consumption of battered, deep-fried wings and French fries. I’m sure that Barbara Roebothan would agree. She’s a registered dietician and facultymember at Memorial University of Newfoundland, currently on a 12-month sabbatical. 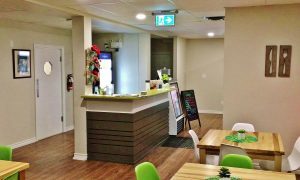 Roebothan and her son, Paul, started a food business in St. John’s about six months ago, called Adley’s Eats, providing homemade meals that are nutritious and balanced. They’re fine tuning as they go but Paul Roebothan broadly explained the business. It’s not a regular dine-in restaurant. It opens at 3 p.m. and closes at 7:30 p.m. Adley’s has a menu (available at www.adleys.ca) for each day it’s open, consisting of a daily choice of three different entrées, two side dishes, one hot side, a soup and dessert. Most customers pre-order meals by phone to take away, specifying a pick-up time. It’s quick and easy. diner with tables, so spouse and I, after ordering our meals early in the day, decided we’d ask to eat in. Understanding the concept, we didn’t expect four-star table service. 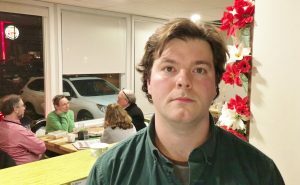 Still, Paul Roebothan did a fine job of waiting on us – as well as two other tables – and managed to serve customers arriving for take away orders. 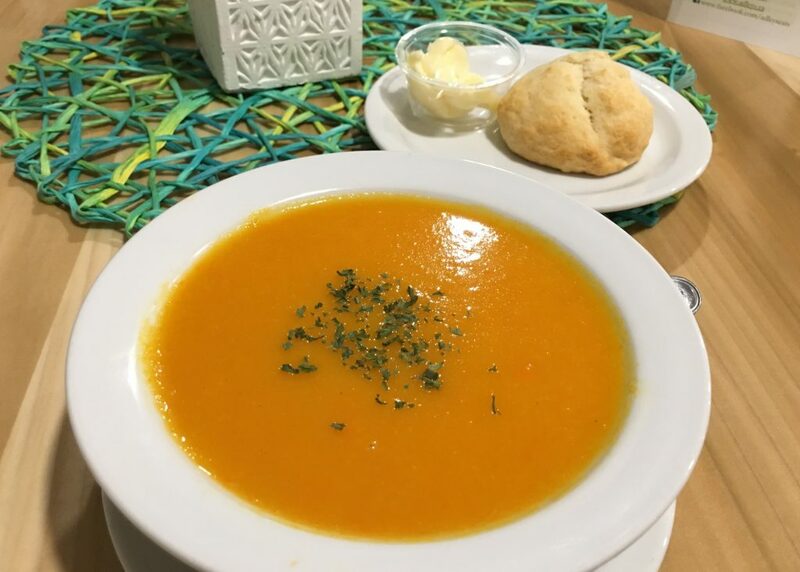 It was Friday and the soup was carrot. 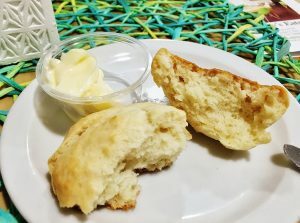 It came with a tea bun that had been made at 3 p.m. It was warm, fragrant and tender. Tea buns don’t come any better. The colourful carrot soup, with sprinkle of fresh herbs, had a nice consistency, meaning not too thin or too thick. It was good. 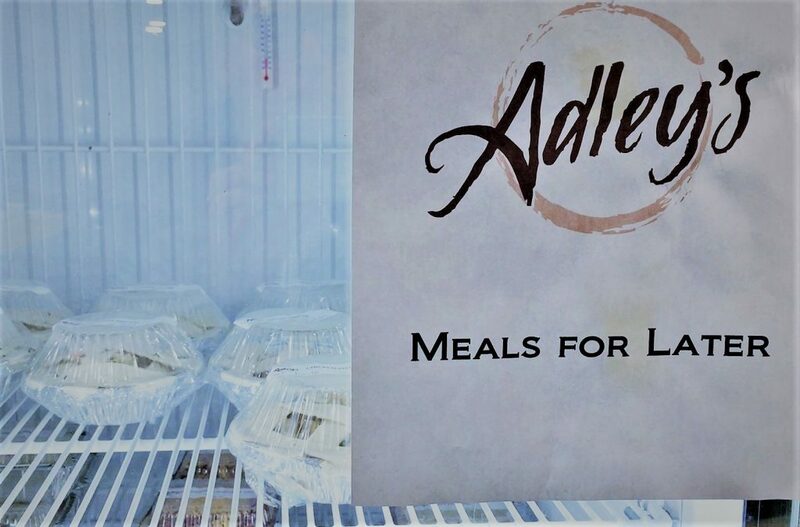 Adley’s didn’t add much salt, which made perfect sense, given the commitment to balanced, nutritious meals. Each table has salt and pepper shakers to accommodate diners who want to add more. 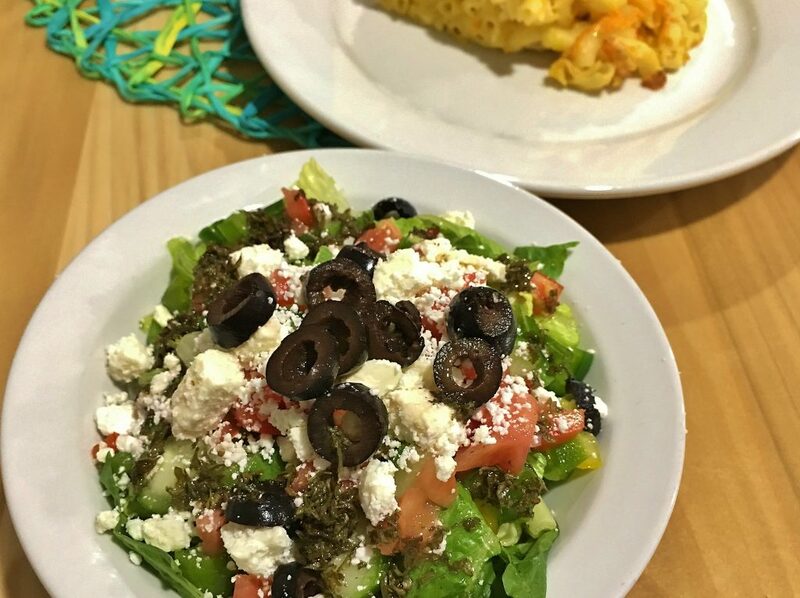 A special black bean salad had been added to the regular Friday menu. It was like a salad Guy Fieri makes, except Fieri’s salad is spicy and contains onions. 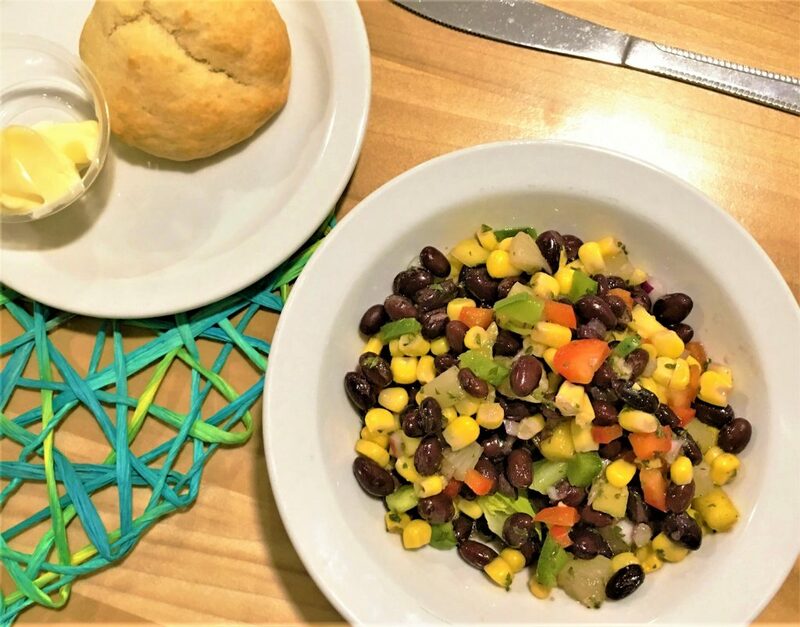 Along with black beans, Adley’s salad featured pineapple, corn, mango, sweet pepper and a dash of herbs – all well marinated in a mild vinaigrette. I liked the colourful, contrasting appearance, which no doubt contributed to its taste. Take one garden salad, add black olives, crumbled feta and a robust oil and vinegar dressing with hints of garlic and oregano, and you’ve got what most folk here call Greek Salad. Adley’s preparation distinguished itself by being exquisitely fresh. It was the perfect side for my macaroni and cheese entrée. At least four of Adley’s daily menus offers a pasta entrée. I’m eager to try Thursday’s lasagna; but I was more than happy with Friday’s macaroni and cheese. It had a bright, cheesy, grilled crust with croutons. 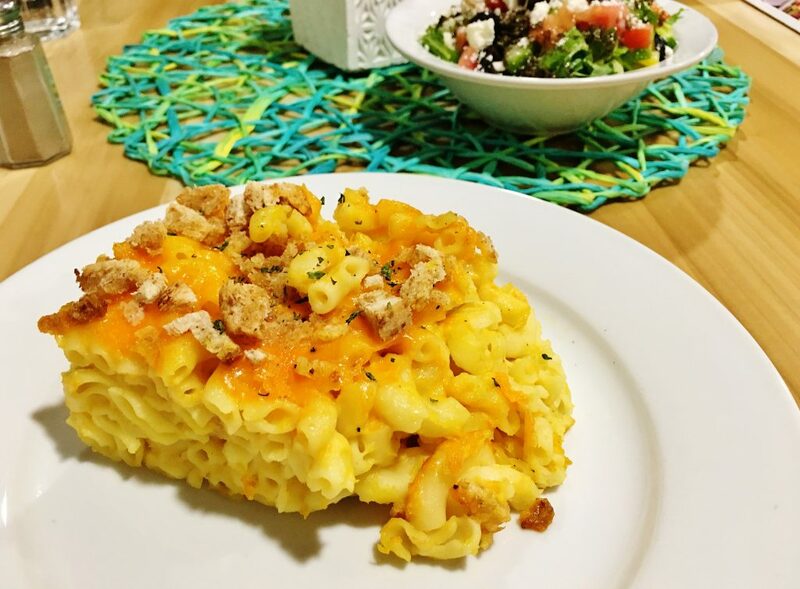 You know, old fashioned mac and cheese, baked until firm enough to cut from a baking pan with a sharp knife, and serve as a single delicious square. Adley’s mac and cheese was one of those comforting rib stickers that tastes even better on damp winter evenings. Spouse had oven BBQ chicken with oven roasted potatoes. Adley’s uses chicken thighs, which for me are the best part because the dark meat is invariably juicy and flavourful. 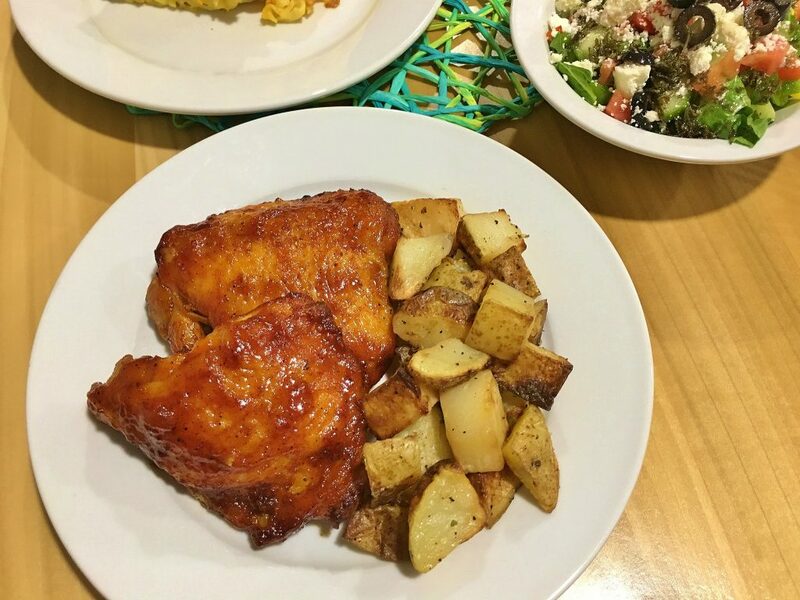 Both thighs were golden and tinged with red, tangy BBQ sauce. Properly roasted, tender, skin on potatoes made a good pairing. Friday dessert was “creamy rice pudding with fresh fruit.” I liked the combining of rice and fresh fruit. I also appreciated the addition of raisins. 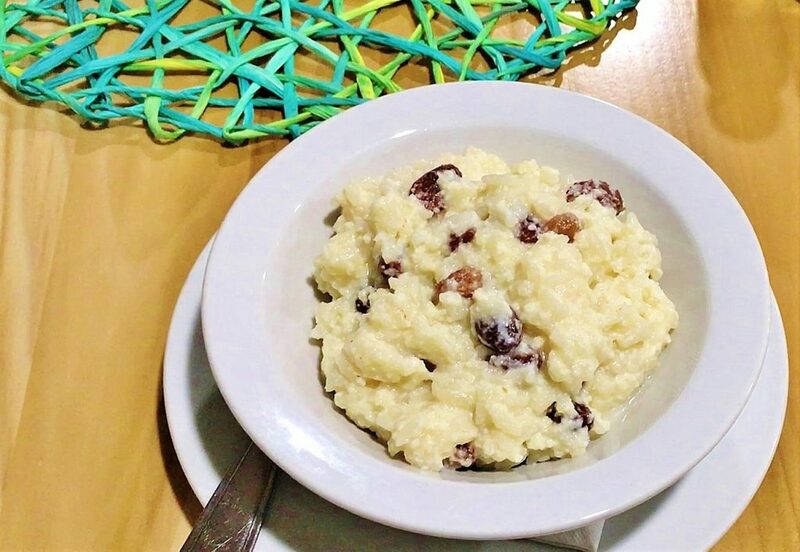 A rice pudding needs raisins to taste homemade, and if not raisins, then some type of dried fruit; for example, dried apricot works well. On homemade taste, Adley’s hit a home-run with this pudding. 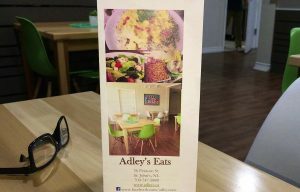 Adley’s Eats is offering a concept that will be welcomed by many in our community. It’s a family business and everybody seems to be pitching in to make it a success. Paul Roebothan told me, “My dad comes and helps me do dishes most nights. My girlfriend comes and helps when need be.” He wished us a good weekend and said thank you. I heard him say that to every customer that evening. I like that. Price Dinner for two with tax and tip costs approximately $38. Open Monday to Saturday: 3 p.m. to 7:30 p.m. Beverages Tea, coffee, water, juice, soft drinks, et cetera. Best bets Everything we tasted was excellent. Gluten free options Some options, depending on the day. For example, rice can be substituted for pasta in several dishes. Plans are in the works to do more to accommodate folk with dietary issues. I was told that recipe testing of some vegan meals is currently underway. Adley’s head cook, named Lisa, is vegan.